You have read somewhere that there is a Paradise in Slovakia, you have seen some pictures of it maybe, and now you are wondering, how to visit this natural beauty? Well, this is the post that answers your questions. It is based on our first-hand experience and on some research and we do NOT recommend to follow this guide word-by-word, but to use it just as a starting point to organise your trip. If you want to make a partial idea of what you might find going to this natural paradise, check out our Gallery! The reason why I decided to write this guide is because I wanted to visit the park myself, fascinated by the pictures I saw on 500px after a friend suggested me this place, but when I reached it I didn’t know much about it and the official website offers a lot of information, but it’s not exactly very friendly, doesn’t answer many questions and doesn’t fit perfectly in the definition of mobile-friendly. Once you know what you want to do, the maps and information on that page will still be useful, so let’s not discard it completely. In order to plan in the best way, first you have to ask yourself “What do I want to do?”. The park in fact offers many different activities and attractions, suitable for a loner up to touristic groups. In the park there are resorts, horse-riding establishments, hotels, restaurants and hiking tracks. From what you want to do, it depends a lot also where to go, because there is not a single point to enter into this huge park. A map for the park can be found here. Around the park you can find here and there maps similar to this, but from the perspective where you are (assume that the cities are around the mountains that form the park itself) plus the GPS signal for our experience worked quite well, so you can use your phone to orientate (although we don’t recommend to count on it too much, phones can be out of battery, signal can change depending on operator, ecc..). By train. There are train stations all around the park. Usually these are still few Km from the actual entrance to the park or the beginning of the hiking trails. Please consider to check the train station closer to the side from where you are planning to arrive. I didn’t take the train myself, so I can’t say about the quality and the frequency of the service, but from what I saw the trains looked ok, although not very frequent. By bus. You can find more information here. There are buses leaving from the biggest cities that reach the towns around the park. Probably this, as for the train, is a good solution for a trip of more days since even if there are few buses per day that doesn’t cause much trouble. By car. This is my recommended way to visit the park and as always the most expensive. This solution is probably suitable more for people with short time that want to optimise the schedule. It is possible to reach by car towns or places very close to the trails and it might be possible also to find a parking lot (paid, but cheap) to leave the car without much worries. The roads that link the cities are good/nice when talking about the ‘outer’ ring and average/bad for the ‘inner’ ones. The fuel in Slovakia is relatively cheap (unleashed 1.20€/l diesel 1.10€/l ) compared to many other european countries. More information about the possible activities can be found here. I also recommend to Google for specific activities (horse riding) depending on what you want to do. I am not a big fan of resorts and my warmest recommendation is to hike the tracks that this park offers. There are many hiking routes in this park, and they are very well marked. Based on the information I could gather there are many reasons to follow the marked routes only. The first is not to spoil the natural environment that is very intact, the second is to avoid to have unpleasant encounters with the wild animals that live in the park. This said, the two most popular routes in this park: Sucha Bela and Velky Sokol. Technical information about these tracks can be found here (Sucha bela) and here (Velky Sokol). Sucha Bela is the easier and shorter of the two, although being relatively difficult as well. This is the route we hiked, and about which we spoke here. This route is a 2h circle. The route is well marked and features the famous wooden ladders! The path follows the course of a river and includes stairs to climb over the waterfalls. The path is one way and the way down is through a comfortable road into the woods. Walking into these gorges offers really beautiful scenarios especially if you are lucky not to meet many other people and also very good photographic spots. The waterfalls are not very tall but they are still very fascinating and during the winter they froze. If you are afraid of heights though, this path won’t be very comfortable, not because the elevation is high but because some wooden ladders are horizontally placed over the body of the river, few meters down, and also some steps are docked to the walls of the mountains. During the hiking I personally met deers, mice and birds but it should be safe. 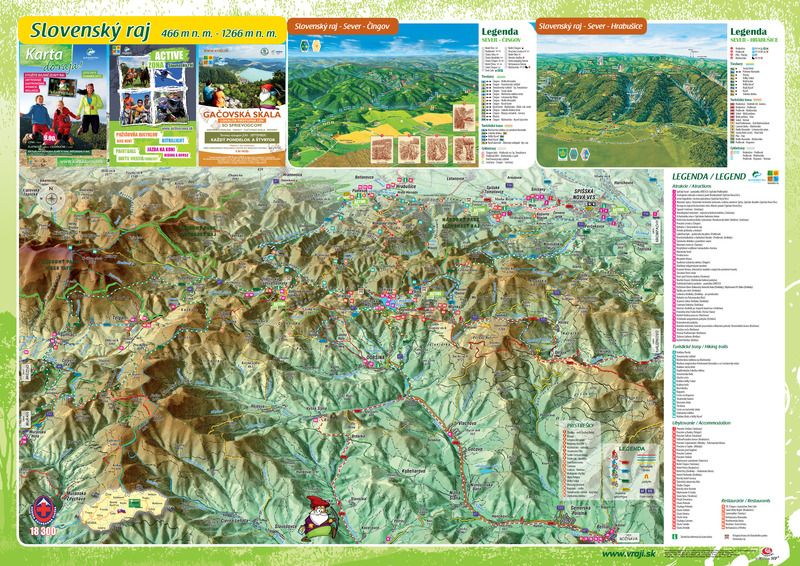 The path starts from Sokol where you can find camping sites, restaurants, parking (3 euro one day/1.5 euro from 14.00). Depending of the time of the year the body of the river can be bigger or quite dry. In either case, wearing hiking boots is recommended to walk freely around without soaking your shoes. This is not vital but might make the walk more pleasuring and also reduces the risk of injuries while walking on rocks. The information I have about this track are result of personal research and NOT based on experience, therefore please, take your time to do your research before venturing there. This route is 21km long, and takes 6-8 hours, therefore is more demanding. This path also includes wooden ladders and steps to overcome the hardest parts. I consider valid for this track some of the info about Sucha Bela. They start from the same point, therefore you can find the same services at the beginning and end of the route. I also feel to recommend as well to wear the proper gear and to pay attention to avoid injuries. Please find more detailed information in the link posted above. This was my first guide ever written, and I consider myself a beginner in this. Anyway, if you have criticism, suggestions, corrections or if this guide has been any useful for you, please leave a comment or write us!